VICE PRESIDENT OF PHILANTHROPY: All-Star Children’s Foundation is seeking a passionate professional to develop and execute a comprehensive fundraising strategy that will support a Foster Children’s Trauma Center in Sarasota, Florida. Working with the Co-founders and the Executive Director, as a key member of the senior staff, the Vice President of Philanthropy will have a pivotal role in creating excitement for the vision, raising funds, and working to ensure continued support for the Center. Go to www.mbjgroup.com, Current Searches for a full job description. Send your resume, cover letter along with salary requirements to marybeth@mbjgroup.com by July 14, 2017. 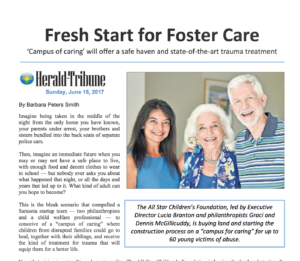 All-Star Children’s Foundation is building a state-of-the-art Campus of Caring that will include a center for trauma-focused clinical services and provide children, victimized by abuse, ages 0-18, with loving and stable homes. The program will bring healing, empowerment and hope to children as well as their parents. Developed in collaboration with John’s Hopkins All Children’s Hospital, this program will become the standard in healing childhood trauma and developing children’s skills necessary to build resiliency. The beautiful 5-acre, neighborhood-style campus will initially serve 30 foster children in residence (Phase 1). It will also serve children in our community’s child welfare system on an out-patient basis. In phase 2 of construction, we will expand our campus to 10 homes, which will accommodate 60+ children. Intellectual curiosity, confidence and ability to apply the experience of traditional development skills to an organization that will transform lives forever. Orchestrate the public phase of a 12 M Capital campaign where 6.5M has been raised during the soft phase. Minimum qualifications include a bachelor’s degree, 7-10 years of development or related work experience, and demonstrated success in marketing, communications, and fundraising. A background in either a for profit or non-profit environment in a staff position or volunteer leadership role is a plus. Healthcare experience and CFRE is a plus.